The Genesis G70 sports sedan is a rare thing in today’s SUV-obsessed world, not least because it offers a genuinely sporty drive in a market awash with ‘sports’ sedans that are anything but. The reason for its sharp dynamics can be traced back to the influence of Albert Biermann, the man formerly responsible for BMW’s M performance line. It was good enough to take the North American Car of the Year award. Equipped as standard with rear-wheel-drive, the G70 can even be specced with a six-speed manual gearbox. The base 2.0-liter turbocharged motor offers 255 horsepower and 260 lb-ft of torque while the 3.3-liter turbocharged V6 (sadly auto-only) makes an impressive 365 hp and 376 lb-ft.
Genesis has been hinting at a performance trim option for the G70 for years now and what better way to stick it to the Germans than with an all-new coupe body style to offer it in? 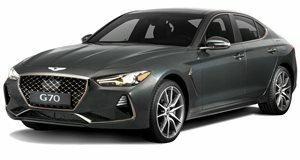 The folks over at the Genesis G70 forum decided to take things into their own hands and designed the render you see here. Fitted with the updated grille from the G90 sedan it could well have come from the manufacturer themselves. The rest of the styling echoes that of the four-door G70 although the larger wheels and two-door layout give it a much more aggressive and purposeful stance. According to the G70 forum, Genesis may well release a G70 Coupe in the near future. If it does happen we imagine that the turbocharged V6 would be a strong competitor to the likes of the BMW 440i and Audi S5 Coupe.